Fisker Inc. might sound like a familiar name, but it's actually a very new company that's just released a few details of its first new vehicle, the EMotion electric sedan. Although the official image doesn't give away much about some of the really revolutionary engineering behind the EMotion, it does show in some style the feature most people will inevitably talk about with this car: its pretty crazy butterfly doors. The company is run by Henrik Fisker, who was also the man behind Fisker Automotive, which produced the Karma electric sedan before the company withered and car went to China, resurrected by a company called Karma as the Revero. Of course, the new company, Fisker Inc., needs a product, and that product is the EMotion. 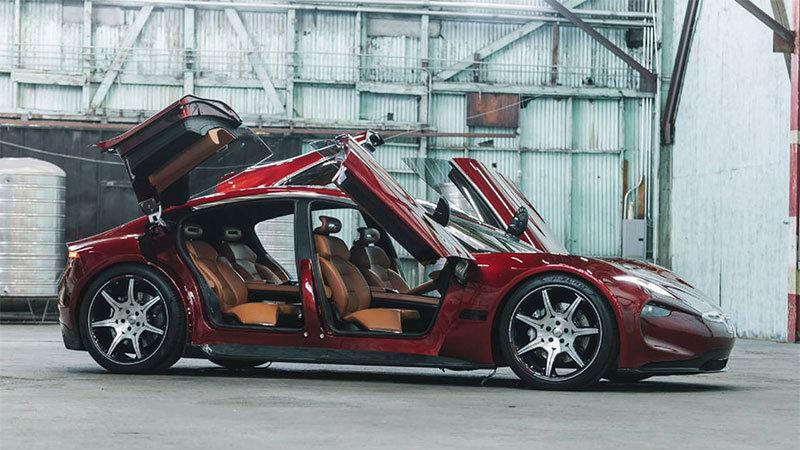 Unsurprisingly, Fisker Inc. is bringing the EMotion to CES in Las Vegas this week, which, as well as the fabulously unusual doors, will also showcase the car's "revolutionary" battery that helps the EMotion to a claimed driving range on a single charge of 400 miles. Although the makers are being a little cautious with details at the moment, we do know a big part of the reason for the car's outstanding range is a massive 143 kWh lithium-ion battery pack, which can be charged enough for a 125-mile range in as little as nine minutes. The company was part of a joint venture with Nanotech working on graphene batteries, but that project fell apart and the lithium-ion batteries now being used have been sourced from LG Chem. Even though the batteries themselves are not out of the ordinary, a proprietary module packaging has been employed that means these could be the most dense battery packs in the world at the moment. Don't expect all the secrets behind the EMotion and its battery pack to be revealed at CES, because the company isn't ready to tell all yet. However, representatives will be on-hand with a version of the battery pack the size of a smartphone to demonstrate the possibilities of the technology. The all-wheel drive EMotion is said to have more rear legroom than many full-size sedans, every seat gets viewing screens, the top speed is expected to be 161 mph, and production is scheduled to commence in 2019 with the base price for one being $129,000.